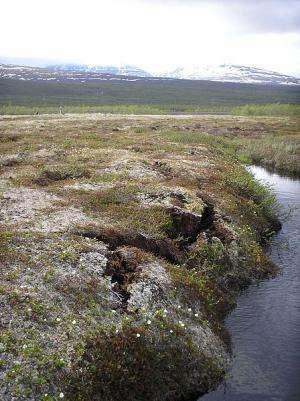 Permafrost underlies nearly 85 percent of Alaska and nearly a quarter of the landmass in the northern hemisphere. This perennially frozen soil contains twice as much carbon as is found in the Earth's atmosphere. Since the Arctic is warming twice as fast as the rest of the planet, understanding carbon uptake and loss in permafrost regions is crucial to improving accuracy of climate models. It also offers clues to how this region will respond and shape a future warmer world. As the Earth's atmosphere warms and causes permafrost to thaw, carbon that's been locked away for hundreds to thousands of years is being made available to microbes. But what are microbes doing with that recently exposed carbon, how fast is it decomposing and how much of a difference does this make in the atmosphere? "Glucose is this really accessible energy source," said Pegoraro, who is part of the Center for Ecosystem Science and Society (Ecoss). "It's like giving the microbes a choice between brownies and a bag of frozen peas at the back of your freezer," where the frozen peas stand in for carbon found in permafrost. That carbon decomposes slowly because of biological, physical and chemical processes. "Unless you were starving, you probably wouldn't touch the peas." Adding glucose at the surface didn't produce much of a sustained response. But at deeper soil layers, where permafrost is found, Pegoraro and her team saw a "priming effect:" microbes respired twice as much soil carbon than the samples that didn't receive glucose. The microbes were eating the "brownies," and, in their sugar high, had the energy needed to decompose soil to access nutrients, releasing more carbon into the atmosphere. "It's a considerable amount of carbon," she said. But Pegoraro's findings suggest that plants may also contribute to some soil carbon loss by releasing glucose from their roots into soil. "We need to consider priming effects to fully understand permafrost carbon dynamics," she said. "Otherwise we could underestimate how much carbon is being lost to the atmosphere." So a researcher extrapolated the effects of adding glucose at depth to permafrost. What's the value produced in adding glucose to permafrost? If you ask me, it's like littering, but it's obviously a way to get the government to take taxpayers' money and give it to a researcher in some convoluted attempt to give the government more control over us. I'd say let the taxpayers keep the fruits of their labor, and let the scientist try to sell their research to non-governmental organizations (e.g. corporations or individuals) for the benefit it produces. This research produces no benefit IMHO. Yes, temperature rises first, then carbon (CO2) increases afterward. Carbon does not cause the temperature increase. You missed the part about man releasing huge quantities of CO2 into the atmosphere first, then rising temperatures causing events like permafrost thawing which release MORE CO2 into the atmosphere, causing more warming. See feedback loop. That's complete BS. All the actual data clearly shows temperature rises, then CO2. Google it, they all agree this happens, but then deny it!!! and blame man because it doesn't fit the scam theory. Enacting all the green ideas will still require 80% of energy to come from oil/coal/gas. These dreamers are new age and delusional. Sadly they'll never except safe thorium molten salt reactors developed at Oak Ridge. Yes, safe, and with no radioactive waste (so not good for making weapons grade material, why scrapped). Liar deniers denying data again. Sorry, deniers, that you hate data. It's kinda like hating the sea level rise flooding your front yard from your septic tank. Oops. temperature rises first, then carbon (CO2) increases afterward. Carbon does not cause the temperature increase. Increased CO2--->Increased Warming--->Exacerbated increased CO2--->Exacerbated Increased Warming---> and so on.